It took me awhile to figure out why I didn’t like Accel World VS Sword Art Online very much. At first I thought it was residual bad feelings from the last SAO game, Hollow Realization. After all, I wasn’t a huge fan of that game, and even if I’ve forgotten why, it’s entirely possible that somewhere deep in my subconscious, I was holding on to that dislike. That, however, is highly unlikely — since, if anything, the fact I liked SAO: Lost Song looms much larger in my memory. Then I thought maybe I just wasn’t following the story. After all, even at the best of times, I barely understood what was going on in previous SAO games; throw in a whole new anime in the form of Accel World, and I think it’d be understandable if I was at a loss. But this isn’t a satisfactory explanation either. I’ve been able to overlook a total lack of comprehension before, so that doesn’t bother me. What’s more, it’s not like the plot is so complex that you require a detailed understanding of both SAO and Accel World. 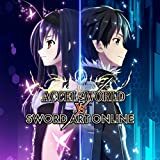 Like every other SAO game, this is a story of the players being trapped in their online world; a quick bit of explanation reveals that the Accel World characters are in roughly the same predicament. All that’s left beyond that is details — and, of course, the unstated question of why SAO players keep playing given the frequency at which their game is highjacked by some malevolent force. It’s not even the massive character roster. Sure, it’s kind of a pain to keep every single one of the 40 (!!!) playable characters appropriately leveled up, and it makes sense if you can’t keep every single one of their names and straight, but that’s really more a subsidiary complaint than anything else. When I get right down to it, I think what bothers me the most about Accel World VS Sword Art Online is that the controls are mediocre at best. Combat is nowhere near as smooth as it was in previous SAO games; everything still feels hacky-slashy, but in a much more disjointed way than was ever the case before. Likewise, basic character movement feels off, particularly if you want to fly. And if you want to combine flight and combat? Then the game just becomes abysmal — which is kind of a big deal, since it occasionally demands that you fight airborne enemies. What’s especially annoying about that is that I know for a fact that these games can be better, since the first two SAO games on Vita were decent. You wouldn’t think that such rapid regression would be possible, but Accel World VS Sword Art Online is proof that it absolutely is.